Hanukkah (alternately spelled Chanukah), meaning “dedication” in Hebrew, refers to the joyous eight-day celebration during which Jews commemorate the victory of the Maccabees over the armies of Syria in 165 B.C.E. and the subsequent liberation and “rededication” of the Temple in Jerusalem. 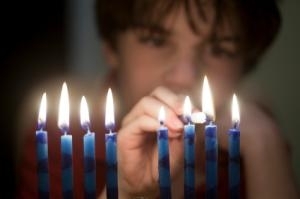 The modern home celebration of Hanukkah centers around the lighting of the hanukkiyah, a special menorah for Hanukkah; foods prepared in oil including latkes (potato pancakes) and sufganiyot (jelly doughnuts); and special songs and games. In 2018, Hanukkah will take place from 2 – 10 December. Unlike many Jewish holidays, Hanukkah (also known as the Festival of Lights) is not mentioned in the Bible. The historical events upon which the celebration is based are recorded in Maccabees I and II, two books contained within a later collection of writings known as the Apocrypha. Although Hanukkah is considered a “minor” Jewish festival, today it ranks-along with Passover and Purim-as one of the most beloved Jewish family holidays. On the 25th day of the Hebrew month of Kislev in 168 B.C.E., the Temple was renamed for the Greek god Zeus. A resistance movement- led by a priestly family known as the Hasmoneans, or Maccabees-developed against the cruelty of Antiochus. The head of the family was Mattathias, an elderly man. His son, Judah, became the chief strategist and military leader of the resistance. Though outnumbered, Judah Maccabee and his fighters miraculously won two major battles, routing the Syrians decisively. Originally, the eight-day holiday was intended to parallel the eight-day festival of Sukkot. The Books of the Maccabees made no mention of the legend concerning a small jar of oil that unexpectedly lasted for eight days. Only centuries after the Maccabees’ defeat of the Syrians did the story of the jar of oil-which has come to be a part of Hanukkah-appear in the Talmud. Although Hanukkah had become an important holiday among the diaspora by the 1920s, it would be incorrect to regard it as an imitation of Christmas with an emphasis on the exchange of presents. Rather, Jewish businesses use this holiday as a celebration of family, reinforcing Jewish identity in a place whose population may be overwhelmingly Christian but in which Jews feel at home. Hanukkah, therefore, is a means for many Jews to feel a kinship with their neighbours, while simultaneously asserting their Jewish distinctiveness.